Cross-country jumping is a test of endurance, skill, and agility following a prescribed course through forest and fields. The horse and rider are required to negotiate natural obstacles like logs, ditches, streams, banks, hills, and fences. The course may be over two miles (4000 meters), although at the lower levels the distance and pace will be much less. 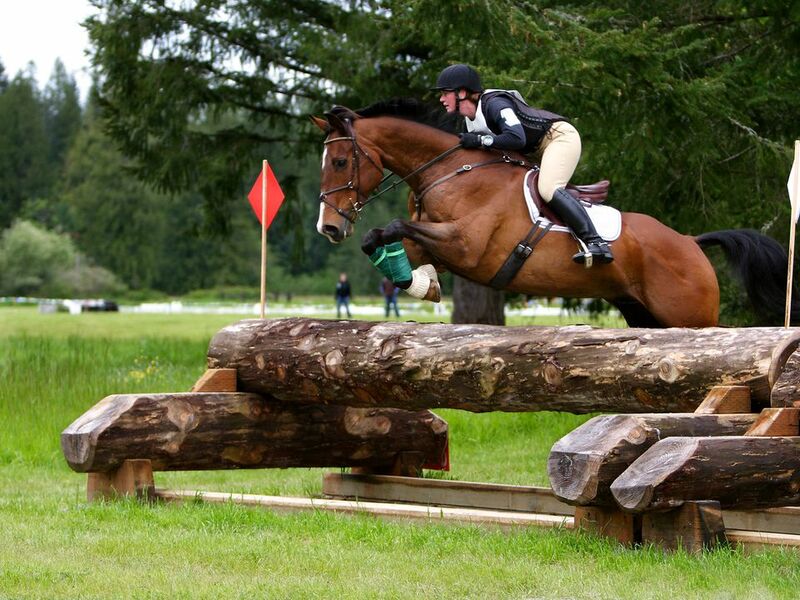 Cross-country jumping is often part of a three-day event or horse trial that may include stadium jumping and dressage. The goal of cross-country jumping is to jump a clear round with no penalties for disobedience, falls, or rider errors. An optimum time is posted and competitors must complete within this time window. While the goal of some competitors may be a ribbon, many compete for the thrill of completing. A forward seat or all-purpose (preferably close contact) English saddle. A humane bit and leather bridle. Synthetic tack may not be allowed (local rules vary). An ASTM helmet (skull caps preferred with no brim). Tall boots or all-leather half chaps and boots (local rules vary). A watch with a large face or readout. At lower levels, this may not be allowed. Before you begin, you will be given an "order of go". Horses may be checked for soundness before and/or after your ride. You will be signaled to start, usually in a start box, and you choose your pace according to the optimum time. When you finish, you will remove your horse's tack, cool him out using cool water, sponges, and a sweat scraper, and present for inspection (local rules will vary). The ideal score is "0", meaning no penalties or time faults. Cross-country jumping is also known by some as endurance riding. Fitness is a very important element, both to compete successfully but safely. A tired horse or rider can mean obstacles are negotiated poorly, resulting in stumbles or falls. Tired muscles can become strained. If you are riding most days of the week, doing flat work and jumping your horse will likely be fine for the lowest levels. You may want to add in conditioning over the same sort of distance and terrain you will be facing. Start slowly, building up speed and distance. Your horse must be controllable in open areas and a confident jumper. Rider fitness is as important as horse fitness. Don't rely on someone else to condition your horse. You must put in hours of schooling with your horse on the flat and over fences to ensure your horse is absolutely obedient. Schooling over a cross-country course with a coach will help you learn pacing and how to safely negotiate the course. Cross-country jumping is a physical and mental challenge for horse and rider. It is a great confidence builder to successfully complete a cross-country course.